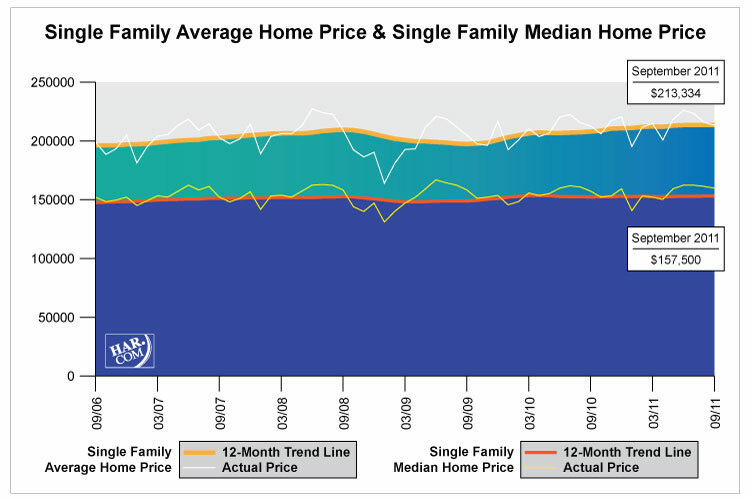 Average and median prices reach September highs; market on "strong footing"
HOUSTON  (October 18, 2011)  Houston temperatures finally cooled a bit in September, but home sales remained hot. Sales of single-family homes climbed nearly 17 percent when compared to one year earlier and accounted for the fourth consecutive month of increased sales volume. The prices of those homes achieved all-time highs for a September in Houston. In addition, months inventory fell to the lowest level since May 2010 while pending sales rose and active listings declined. All are considered signs of a healthy and balanced housing market as the fall season gets underway. According to the latest monthly data prepared by the Houston Association of REALTORS® (HAR), September sales of single-family homes rose 16.9 percent versus one year earlier. This increase followed home sales gains recorded in January, June, July and August of this year. All segments of the housing market, from the sub-$80,000 to the $500,000 and above, experienced positive sales in September. On a year-to-date basis, sales were up 3.2 percent. "The combination of increased closed and pending sales, fewer active listings and strong pricing suggests that we are entering the fall home buying season on strong footing," said Carlos P. Bujosa, HAR chairman and VP at Transwestern. "HAR's September report shows rebalanced supply and demand throughout the Houston housing market with diminishing traces of the distortions caused by last year's federal home buyer tax credit." The average price of a single-family home ticked up 0.4 percent from September 2010 to $213,334, the highest level for a September in Houston. The September single-family home median pricethe figure at which half of the homes sold for more and half sold for lessalso reached a September high for the market, rising 1.6 percent to $157,500. Foreclosure property sales reported in the Multiple Listing Service (MLS) increased 2.4 percent year-over-year in September. Foreclosures comprised 19.4 percent of all property sales, which is consistent with the levels it has maintained each month since May when it was more than 22 percent. The median price of foreclosures in September was flat at $81,900. September sales of all property types in Houston totaled 5,469, up 15.9 percent compared to September 2010. Total dollar volume for properties sold during the month jumped 16.0 percent to $1.1 billion versus $962 million one year earlier. The month of September brought Houston's overall housing market positive results when all sales categories are compared to September of 2010. Sales volume gains showed more normal, seasonal trending after several months in which the data was skewed by the 2010 tax credit that caused a dramatic drop in home sales following its expiration. Total property sales and total dollar volume rose on a year-over-year basis. Both average and median prices climbed to historic levels for a September in Houston. Month-end pending sales for September totaled 3,120. That is up 3.2 percent from last year and suggests the likelihood of another positive month of sales when the October figures are tallied. The number of available properties, or active listings, at the end of September declined 11.5 percent from September 2010 to 47,812. The inventory of single-family homes was reduced to 6.8 months, its lowest level since May 2010, compared to 7.7 months one year earlier. That means it would take 6.8 months to sell all the single-family homes on the market based on sales activity over the past year. The figure is significantly better than the national inventory of single-family homes of 8.5 months reported by the National Association of REALTORS® (NAR). These indicators all reflect a balanced real estate marketplace for Houston. September sales of single-family homes in Houston totaled 4,635, up 16.9 percent from September 2010. This marks the fifth increase of the year following an 8.5 percent gain in January, 1.3 percent rise in June, and 15.2 and 28.3 percent increases in July and August, respectively. On a year-to-date basis, sales are ahead 3.2 percent. Broken out by segment, September sales of homes priced below $80,000 rose 11.4 percent; sales of homes in the $80,000-$150,000 range climbed 21.8 percent; sales of homes between $150,000 and $250,000 were up 18.7 percent; sales of homes ranging from $250,000-$500,000 jumped 26.8 percent; and sales of homes that make up the luxury marketpriced from $500,000 and upadvanced 2.3 percent. Both average and median price achieved the highest levels ever for a September in Houston. At $213,334, the average price of single-family homes rose 0.4 percent compared to last September. At $157,500, the median sales price for single-family homes edged up 1.6 percent versus September 2010. The national single-family median price reported by NAR is $168,300, illustrating the continued higher value and lower cost of living available to consumers in Houston. HAR also breaks out the sales performance of existing single-family homes throughout the Houston market. In September 2011, existing home sales totaled 3,880, a 20.0 percent hike from September 2010. The average sales price ticked up 0.4 percent to $201,836 compared to last year and the median sales price of $145,000 reflects an increase of 2.1 percent. The number of townhouses and condominiums that sold in September jumped 14.0 percent compared to one year earlier, marking the fourth monthly sales increase of the year. The first was a 14.7 percent rise in January, followed by a 25.3 percent increase in June and 19.2 percent gain in August. In the greater Houston area, 383 units were sold last month versus 336 properties in September 2010. The average price slid 0.9 percent to $152,275 from September 2010 to September 2011. The median price of a townhouse/condominium edged up 0.9 percent to $115,000. September saw continued elevated demand for lease properties throughout the Houston market. Single-family home rentals rose 17.4 percent compared to one year earlier and year-over-year townhouse/condominium rentals jumped 30.0 percent. HAR has reported for several months that this demand has been largely fueled by steady improvement in local employment numbers, with REALTORS® observing a surge in consumers relocating to Houston from around the U.S. The Texas Workforce Commission recently reported that the Greater Houston area gained 65,000 jobs from August 2010 to August 2011, a 2.6 percent increase. 6.8 months inventory of single-family homes is the lowest level since May 2010 and compares favorably to the national average of 8.5 months.